Yes, I know it's strange to review my own conference but it's also one of the best ways to continue to improve them in the future and to share what goes on behind the scenes at these events. Even though we've now had 4 annual events in Chiang Mai over the past 4 years, my goal has always been to help spread the Nomad Summit outside of Thailand. The plan is to always have the main conference in Chiang Mai every January as it's the best time of the year to be there weather wise, and because that's where it all started, but I've been dreaming about having a second event in another country as well. Time wise it actually works out perfectly to have two events a year, spread out around 6 months apart as it gives people something to look forward to twice a year and to continue talking about instead of just annually which allows a bit too much time to pass for people to plan and stay excited. The reason why I chose the USA this year even though I seriously considered places like Playa Del Carmen in Mexico, and considered places in Europe like Poland, Ukraine, or Portugal or even Medellin, Colombia is because honestly I don't know any of those places that well and don't know what the audience there really needs. Growing up in America myself and escaping the 9-5 to move to Thailand was super difficult for me personally but I'm so glad I did it, which is why I wanted to help others do the same. It was a crazy journey this year trying to organize a conference in the USA while I was traveling in Europe. But I knew that Americans, Canadians, and people who were living there would benefit the most. I know all of the tax, travel, and business hacks that allow North Americans to really take advantage of location independence, online business and tax savings and knew what type of speakers to bring on board. The Nomad Summit events in Chiang Mai have become super easy as i've already done the difficult work on scouting venues, finding vendors, and even the marketing. However doing an even in the USA first meant trying to figure out if we should do it in LA, SF, Las Vegas, Austin or somewhere else, then trying to make it all work for a budget everyone could afford to attend. I'm still shocked we were able to pull it off and make everything seem like it went smoothly as behind the scenes it was a crazy whirlwind of fires to put out. I want to thank my co-organizes for this year Alexandra and Candy for their amazing work to help make it all happen, without them, the event wouldn't have been nearly as successful. Also we had some amazing speakers, volunteers and videographers this year that really made it special. Keep reading for how it all turned out, videos of the events, talks, financials and a breakdown of how it all went plus some demographics, survey results, and other fun behind the scenes breakdowns. 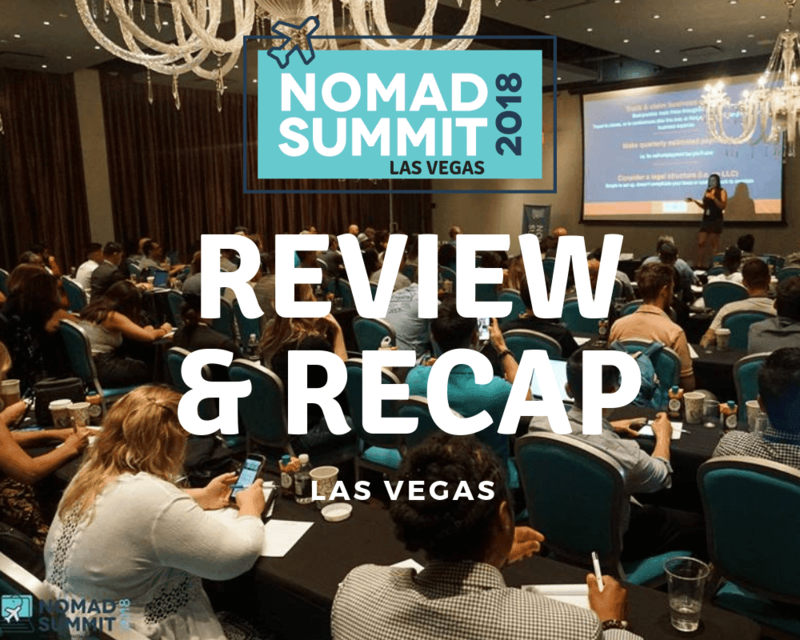 The easiest way to get an idea of what the event itself was like is to watch this mini-documentary style after movie of the Nomad Summit Las Vegas. It was created by an award winning local journalist who really captured the essence of what a digital nomad is, what the Nomad Summit is and why people attend. Take a listen and check out what the event was like. It really feels like you were there just by watching this! In our previous Thailand events, we had people from 40+ different countries attend as it really as a global destination and conference. 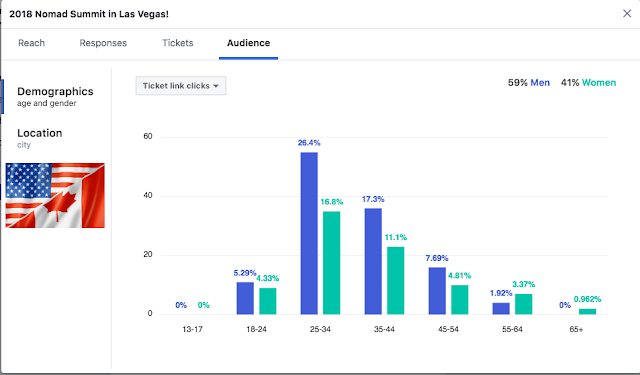 However, as expected the vast majority of attendees at the Las Vegas event were either from the USA or Canada with around 70% being American, 25% being Canadian, and 5% being from other places like the Mexico or London. Even though culturally we had people from all different ethnicities, almost everyone in attendance with the exception of a few were currently living somewhere in America or Canada. For age range, our youngest attendees were both 18, and our oldest were in their late 50's but with the vast majority of attendees being from age 25-40 years old. The ratio of men to women was just around 60/40 with a bit more men, but without planning it this way more than half of the speakers this year happened to be women. As for employment levels, it was a really good mix of people who had full time jobs but were looking at starting a side business, to people who are already successful and location independent. Some people were just starting out, while some were already making more than $100,000 a year online. 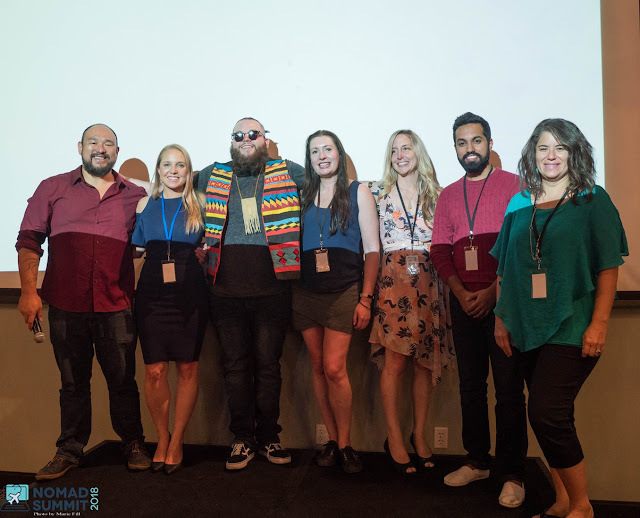 Even though it's honestly easier to create a conference aimed solely at people either just starting out and brand new, or directly solely towards those already with a business, I firmly believe that mixing the two has a ton of value for both sides. People starting out can be inspired and learn from those who already have success. While those already successful can get re inspired at the excitement and energy of those just starting out. It's also a great way to find mentors, interns, and form business partnerships. Overall, I think the demographics turned out exactly as we expected, and I was glad to see diversity in age, gender, and entrepreneurial progress. It did make it easier to plan some of the topics and talks knowing that the majority of attendees would be North American, but I also wanted to make sure there would be something of value for everyone, even if they were flying in from another country. After each event, we make sure to survey everyone who attended. But even before those go out, just hearing from people talk after the conference and the random messages we get online as well as in person, give us a pretty good idea of what people thought. Our goal and key metric is to make sure that everyone gets so much value that they not only want to come to the next one themselves, but also that they liked it enough to recomend it to a friend. 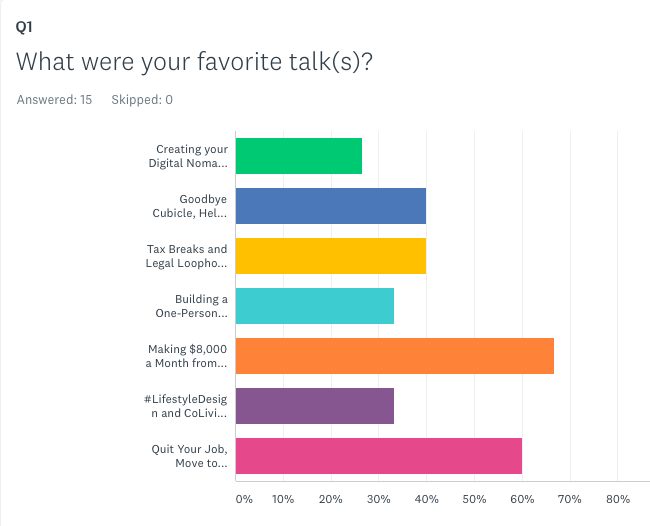 Here are a few of the survey results we got from attendees when asking them what they thought. Out net result was that surprisingly 100% of attendees who answered the survey said they liked the event for themselves and 80% of of those attendees said they have already recommended it to a friend. Of course not everyone took the time to answer the survey, but in general the people who take the time to do so are usually the people who really loved the event, and those who really hated it. I'm glad to report that this year it was hugely positive and not a single person reported back saying it wasn't worth flying to Las Vegas, paying for hotels, and the conference to attend. Here are some of the optional responses people left in additional to the vote. Event though I'm happy that everyone got a lot from the event and overall enjoyed it. There were also a ton of things for us to learn and take away from. The first being choosing the venue and weekend for the conference. It's a difficult decision as on one hand, if we held the event over a random non 3 day weekend, flights, hotel rooms, night club entrance and even things like buffets would have been much cheaper. We could have probably even had the event on the strip itself for the same price. But since I know how difficult it is for most people who are still working a job to get time off, I wanted to make it as accessible for everyone to attend which is why we held it over labor day weekend. It worked out well, but I honestly don't know if I would do it over a public holiday weekend again as it added so much stress and cost to it all. It also made the weekend super long especially since the staff and I have to be there a few days early to start preparing and were all exhausted by the time the pool party was over on Monday. The biggest hurdle were the workshops which I'm still trying to figure out how to perfect. On one hand, it'd be easier just not to have them at all. 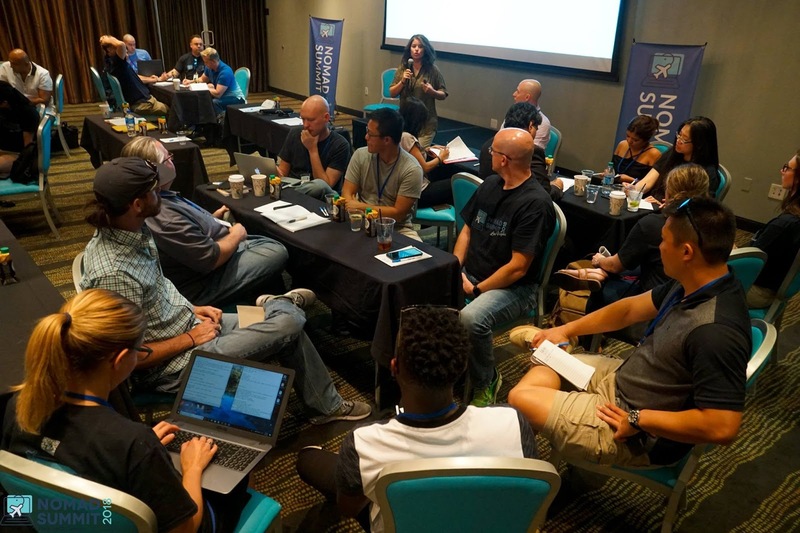 But on the other, being able to have smaller groups really deep dive into specific actionable steps make it so attendees leave not only with inspiration, but also the start to a new business. Financially the added workshop day really caused a mess. At first the idea was to have some free workshops included and charge for others. But it was honestly really hard trying to figure out which ones we should charge for and which ones should be free. It was a mess both organizationally and financially as because of the extra day of room rental we were actually losing money and running at a net negative up until just a few days before the event. Even though I really didn't want to, I ended up just asking attendees going to the workshop for an optional donation to help cover the costs. I can imagine how annoying it was to some people, but I'm grateful that people liked the event enough and go so much value from the main day that no one hesitated to chip in if they could afford it. But lesson learned, for future events, I'm going to have one team member's specific job to be to organize the workshop day and we'll make pricing clear from the start so we don't run into this issue again. Overall judging from the responses from everyone who attended, people really loved the presentations and talks and our goal to have a spread of something for everyone really came through. As with all good conferences, the goal is not only to give people what they want, but also introduce topics to them that they didn't previously think about but in reality really need. Also by making sure that everyone would leave really loving some of the talks not not feeling like we need to please everyone all of the time, it really allows us to deliver a wide range of topics that we feel like would benefit people not only just now, but also plant seeds for them to start thinking about in the future. That being said I'm really glad we had a really good mixture of inspiration to get people to act, but also actionable steps for people to follow. Some things might have been too advanced for some, or too basic for others, but overall, i'm glad to hear every speaker and every topic got at least a 25% vote for the favorite talk of the event. Here are the survey results from people who took it as well as an embed of the full length talks from the ones that have already been released. 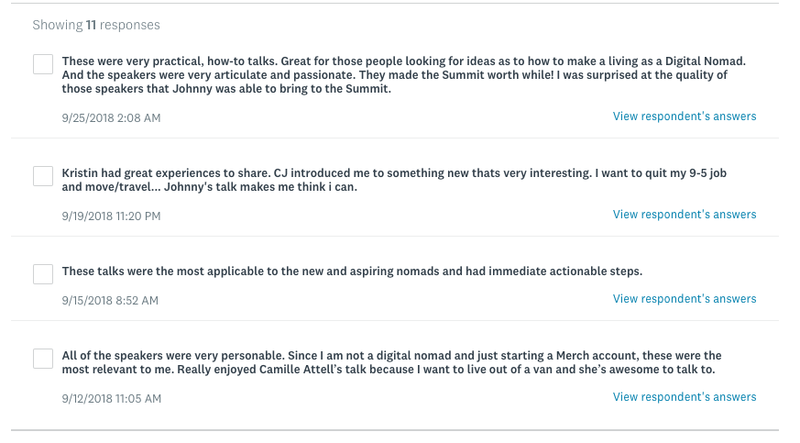 Subscribe to our email list at Nomad Summit to get access to all of the talks for free as soon as they come out. And big thanks to our two sponsors for the event as with their financial support, we're able to hire professional videographers to record all of the talks and give them to you for free even if you couldn't attend the event. So thank you to Dropship Lifestyle and to Empire Flippers for their support! As I mention in this year's talk, which will be uploaded in a few weeks time if you're subscribed, I feel very fortunate to be able to invest as much time and energy on putting together this conference as I do. Financially, I made a ton more money when I was focused on my own businesses, affiliate marketing, and starting and selling dropshipping stores. However, ever since I earned and saved up enough money to officially retire and not have to work any more, after a few months of laying around on the beach, surfing, scuba diving, and traveling around, I got bored and started focusing again on passion projects. 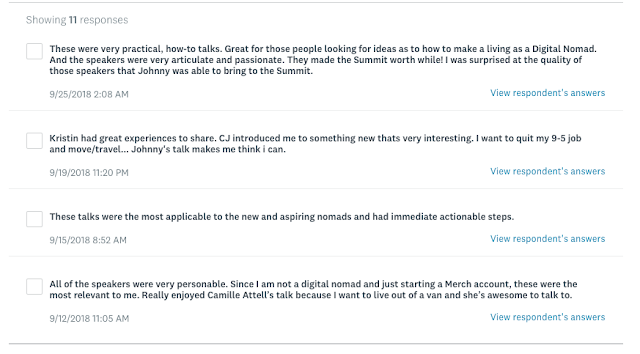 Aside from my podcasts and my blog, my biggest project is the Nomad Summit conference. Financially, it's been a terrible investment of both time and money and a huge risk as well. Just the fact that I have to put down a non refundable deposit of $10,000 or more dollars months in advance just to secure a venue even before we sell nearly enough tickets is a huge financial risk. Also putting hundreds if not over a thousand hours in preparation months before an event means that I'm often getting paid sometimes pennies for my time, when I could be making a ton of a lot more doing something else. However, I really love it, and the feedback I get from people I meet in person, especially from return attendees who come back saying how much their lives have changed make it all worth it. Even though I didn't actually pay myself for this event and the profits barely covered travel costs, I don't regret doing it for a second. The people I met, the experiences I had, and the momentum for the future makes it all worth it. Do I wish we made tens of thousands of dollars from this event? Sure. Do I hope that we can fill a convention center with 1,000+ attendees in the future and have it be a wildly profitable event? Heck yes. 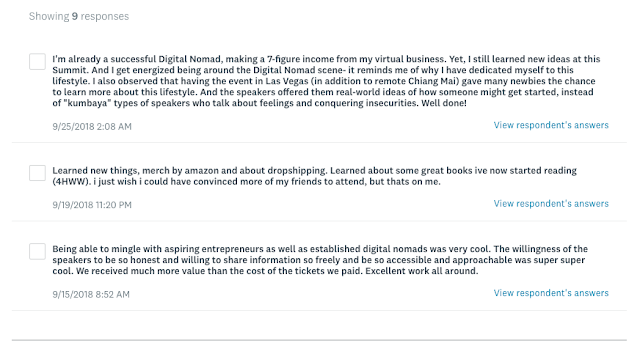 But even though it's a long, slow process, I enjoy every minute of it, and know how much it helps both the digital nomad community as a whole, but also the people who attend. 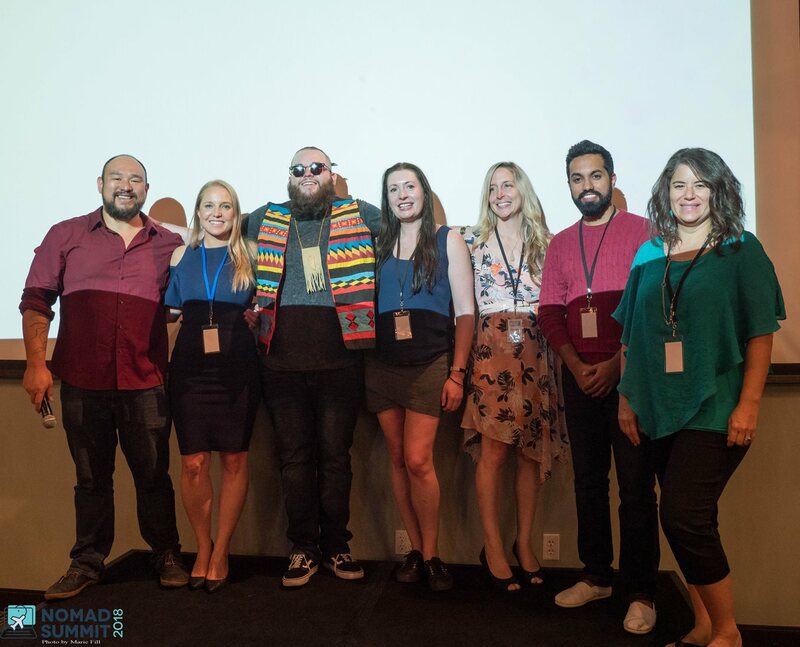 So that being said, in my eyes, the first annual Nomad Summit in Las Vegas was a success, and I hope to see all of you at the next one! RSVP for the upcoming 2019 Nomad Summit in Thailand or visit NomadSummit.com for tickets and more information. Big thanks to all of the speaker's from this year! Been to a conference? Have Questions? Leave a comment below! What was your favorite thing about the Nomad Summit? Leave a comment below or ask questions here. Sounds like an awesome time Johnny. If I get to Chiang Mai in January I'd love to attend the CM summit. But either way I'll be there by February or March, latest. Make it happen! Try to get there before January 19th!